There are more than 65 million people around the world currently displaced from their homes, the highest number since the Second World War. Many are fleeing persecution, poverty and war in their home countries, but are forced by official barriers into underground human-trafficking networks. Current and proposed policies to severely restrict the ability to seek asylum in the United States, along with the US government’s unwillingness to quickly process migrants at ports of entry along the US- Mexican border, have created an administrative limbo that leaves Central American asylum seekers in Mexico exposed to further violence, said the international medical humanitarian organization Doctors Without Borders/Médecins Sans Frontières (MSF) in a press release on Thursday, December 13, 2018. In Mexico, MSF provides humanitarian assistance to people escaping horrific levels of violence in El Salvador, Honduras and Guatemala. Many have survived the murder of family members, kidnapping, recruitment by armed groups, extortion and sexual violence. Many of them fear death and violence if they are forced to return home. The vast majority of Central Americans who are traveling through Mexico are fleeing violence, extortion and forced recruitment at the hands of criminal organizations and gangs in Honduras, El Salvador and Guatemala. During their transit north through Mexico, many are exposed to further dangers, in particular cruel, inhumane and degrading treatment by the criminal organizations that control these routes — including assaults, extortion, sexual violence, human trafficking, kidnappings and torture. While refugees, migrants, and asylum seekers continue to die in the Mediterranean Sea, Doctors Without Borders/Médecins Sans Frontières (MSF), together with its partner SOS Méditerranée, have been forced to terminate operations of our search-and-rescue vessel, the Aquarius. Over the past two months, as people have continued to risk their lives at sea crossing the world’s deadliest maritime migration route, the Aquarius has remained in port, unable to carry out its humanitarian work as a result of a sustained campaign spearheaded by the Italian government and backed by other European states. Attacks aimed at delegitimizing, slandering and obstructing aid organizations have hindered assistance to vulnerable people. Coupled with the European Union’s ill-conceived external policies on migration, these campaigns are undermining international law and humanitarian principles. With no immediate solution to these attacks, MSF and SOS MEDITERRANEE have no other choice but to begin decommissioning the Aquarius. Over the past 18 months, the unprecedented efforts curtailing humanitarian assistance have drawn upon tactics used in some of the world’s most repressive states. Despite working in full compliance and transparency with authorities, the Aquarius was twice stripped of its registration earlier this year due to political motives, and now faces absurd allegations of criminal activity. Amidst smear campaigns and deliberate manoeuvres to undermine international law, people rescued at sea have been denied access to safe ports, refused assistance from other ships and left stranded at sea for weeks at a time. This op-ed was originally published by Le Devoir on December 7, 2018. The Mediterranean Sea is the world’s deadliest stretch of water. More than 2,000 people have died trying to cross it this year, virtually all of them migrants and refugees fleeing conflict, trauma and persecution in their home countries. Many have no choice but to place themselves in unseaworthy and over-filled vessels in a last desperate attempt to reach safety in Europe. Many do not survive. Recent actions by some European governments have now made the likelihood of more deaths even higher. Despite obligations under international law to help people in distress at sea, European authorities have drastically reduced their search-and-rescue operations — and in the case of Italy, have not only refused to accept asylum seekers arriving by sea but have taken aggressive action against organizations working to save lives and prevent more drownings on the water. Since 2015, Doctors Without Borders/Médecins Sans Frontières (MSF) has helped more than 60,000 people at risk on the Mediterranean Sea. Last year alone, teams on the Aquarius, a search-and-rescue ship operated by MSF in partnership with the charity SOS Méditerranée, rescued more than 15,000 people from drowning. As a result of those efforts, we have come under attack from not only anti-migrant groups in Europe, but from the efforts of European governments themselves to stop our lifesaving actions. Italy’s new coalition government, in particular, has aggressively targeted MSF: pressuring Panama to revoke the flag of the Aquarius ship; suspending our bank accounts; and spuriously accusing us of colluding with human traffickers and illegally dumping medical waste, all leading to a suspension of our search-and-rescue efforts. These are not just attacks on MSF. Similar actions have been taken against other humanitarian search-and-rescue ships working on the Mediterranean Sea. They are a concerted assault on the foundations of international law and the entire legal framework governing humanitarian action. And they are part of a worrying trend in which governments seek to criminalize humanitarian aid using inappropriate legal mechanisms to further their political agendas. This approach, intended or otherwise, undermines the foundations of the international legal system that was put in place after the horrors of the Second World War — to protect civilians and prevent suffering caused by conflict, displacement and humanitarian crisis. We applaud Minister Freeland’s plans to stand up for a system that holds member states to their responsibilities under international law, and we hope she will take this opportunity to demonstrate that Canada stands firmly against the continued erosion of the international framework upon which all humanitarian action depends. To that end, we encourage Minister Freeland to insist on a cessation of unfounded legal assaults on humanitarian rescue efforts in the Mediterranean Sea, and to demand that our European allies must uphold their obligations under international maritime law, so that organizations such as MSF can resume their lifesaving search-and-rescue operations. Policies under which passengers on intercepted migrant ships are returned to Libya, a place where they are frequently subjected to detention, torture and horrific abuse — and is clearly not the safe harbour demanded by international maritime conventions — must also stop. Over the past two months, as refugees, migrants and asylum seekers have continued to put their lives at risk crossing the Mediterranean Sea, the Aquarius has remained in port, unable to carry out its humanitarian work as a result of a sustained campaign spearheaded by the Italian government and backed by other European states. Attacks aimed at delegitimizing, slandering and obstructing aid organizations have hindered assistance to vulnerable people. These campaigns are undermining international law and humanitarian principles. With no immediate solution, MSF and our partners SOS Méditerranée announced yesterday that we have no other choice but to begin decommissioning our search-and-rescue ship, the Aquarius. That will mean more needless deaths at sea. For MSF, this represents a dark day for international humanitarian values in Europe. We are looking to Canada to remind our allies that those values are matters of principle, not political convenience. Joe Belliveau is Executive Director of Doctors Without Borders/Médecins Sans Frontières (MSF) Canada. Every year an estimated 500,000 people ﬂee extreme violence and poverty in the Northern Triangle of Central America, which includes Honduras, El Salvador, and Guatemala. Despite catastrophic conditions in the region, the United States and Mexico have focused efforts on detention and deportation rather than on providing safety and support. 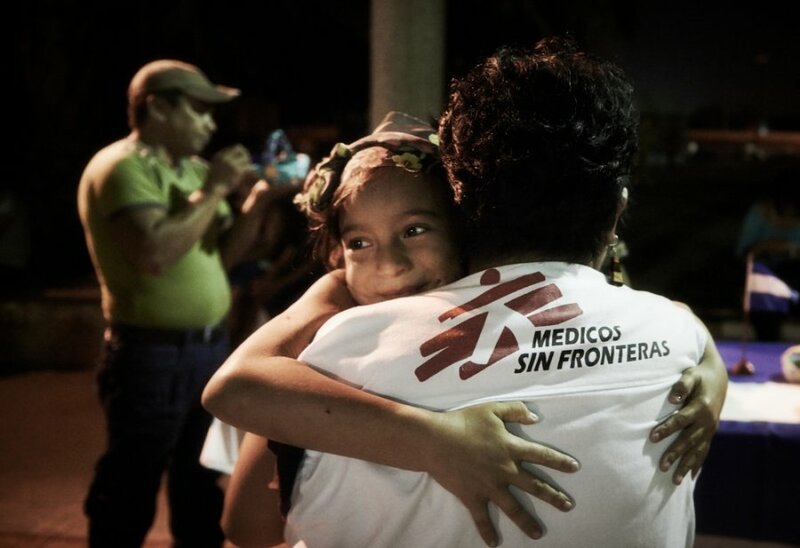 Doctors Without Borders/Médecins Sans Frontières (MSF) teams offer medical and psychosocial care to displaced people in Central America and Mexico. Stephanie Puccetti is a humanitarian aﬀairs advisor for MSF's office in the United States. She recently travelled through Honduras, Mexico, and along the US border to gather information about the challenges facing migrants and asylum seekers. As part of a global team that represents MSF’s operations to key stakeholders—including governments, intergovernmental organizations, and other humanitarian groups—she works to ensure that those making decisions at the political and policy levels understand the implications for crisis-aﬀected communities. Through sharing perspectives from our staﬀ in the ﬁeld and from our patients, MSF aims to protect and expand the space for medical humanitarian action. Doctors Without Borders/​Médecins Sans Frontières (MSF) strongly condemns the government of Nauru’s sudden decision to cease the provision of desperately needed mental health care provided by MSF to asylum seekers, refugees and the local community on Nauru. The international humanitarian medical organization describes the mental health situation of refugees on the island as “beyond desperate” and calls for the immediate evacuation of all asylum seekers and refugees from the island and for an end to the Australian offshore detention policy. Doctors Without Borders/Médecins Sans Frontières (MSF) is witnessing an unprecedented health and mental health emergency among the men, women and especially children kept in Moria camp, on Lesvos, Greece. MSF is calling for the emergency evacuation of all vulnerable people, especially children, to safe accommodation on the Greek mainland and within the European Union. The policy of containing asylum seekers on Greek islands has led to more than 9,000 people, a third of whom are children, being stuck indefinitely in the Moria camp, which has a maximum capacity of 3,100 people. The @MSF_Sea Twitter account brings you the latest updates from our maritime operations seeking to provide rescue and care people at risk of dying on dangerous migration journeys. “The European political decisions that have been taken during the past weeks have had deadly consequences. There has been a cold-blooded decision to leave men, women and children to drown in the Mediterranean Sea. This is outrageous and unacceptable,” said Karline Kleijer, MSF’s head of emergencies. “Rather than deliberately obstructing the provision of lifesaving medical and humanitarian assistance to people in distress at sea, European governments must set up proactive and dedicated search and rescue capacity in the Central Mediterranean”. European governments are fully aware of the alarming levels of violence and exploitation suffered by refugees, asylum-seekers and migrants in Libya but are determined to prevent people from reaching Europe at all costs. A key part of the strategy to seal off the Mediterranean is equipping, training and supporting the Libyan Coast Guard to intercept people at sea and return them to Libya. Returning people to Libya is something non-Libyan ships cannot lawfully do as the country is not recognized as a place of safety. People rescued in the international waters of Mediterranean must not be returned to Libya but should be taken to a safe port in line with international and maritime law. The Trump Administration is now dismantling protections enshrined in US and international law designed to protect refugees and asylum seekers. US authorities are now subjecting people who have been the victims of crime, torture, and abuse to even greater harm and suffering—including detaining and forcibly separating children from their families. Mexico is not safe for the thousands of Central Americans fleeing violence and persecution in their home countries. Due to ever tighter and more callous US border control policies, thousands of vulnerable people are effectively trapped in Mexico, left exposed to further violence by criminal gangs who prey on them. As an international medical humanitarian organization, Doctors without Borders/Médecins Sans Frontières (MSF) delivers medical care and psychological assistance to vulnerable displaced populations all over the world. We witness the forces driving people from their homes, and the prices they must pay as they try to reach safety and the chance for a better life. The Faces of Displacement photo exhibit shares a few of these personal stories. After days at sea, 630 people rescued in the Mediterranean sea have been safely disembarked in Valencia, Spain. The Aquarius, a dedicated search and rescue vessel run by SOS MEDITERRANEE in partnership with Doctors Without Borders/Médecins Sans Frontières (MSF), had been stuck in international waters between Italy and Malta, the countries with the closest ports of safety, but which continued to refuse permission to dock. This incident draws attention to the collective inaction of the European Union in the face of a dire humanitarian crisis. Dr. David Beverslius, an MSF doctor aboard the Aquarius, calls the European community's indifference "a disgrace and a stain on modern Europe." For more than two years, Doctors Without Borders/Médecins Sans Frontières (MSF) has been providing medical care to refugees, asylum-seekers and migrants held inside Tripoli detention centres in Libya, in conditions that are horrific and inhumane. 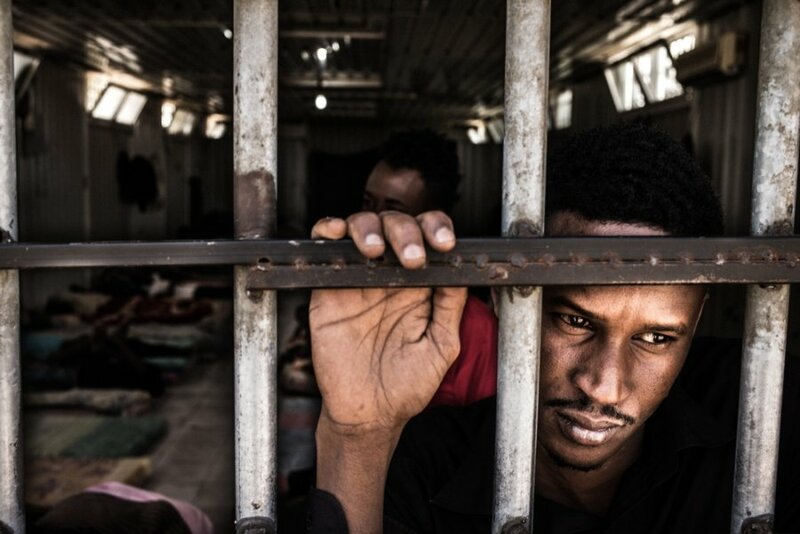 With no rule of law in Libya, the detention system is harmful and exploitative. There is a disturbing lack of oversight and regulation. With no formal registration or proper record-keeping in place, once people are inside a detention centre there is no way to track what happens to them. Some people are held for prolonged periods of time; others are transferred between different detention centres, moved to undisclosed locations or disappear overnight.MSF witnesses on a daily basis how much unnecessary harm is being caused by detaining people in these conditions. There is only so much medical teams can do to ease the suffering. MSF calls for an end to the arbitrary detention of refugees, asylum-seekers and migrants in Libya. Dominika Wanczyk talks with rescued migrants after an operation that pulled 99 people out of a sinking boat. Two months ago, Dominika Wanczyk found herself providing comfort to a young girl from Ivory Coast who had recently been rescued from a sinking vessel in the Mediterranean Sea. Reflecting on her time onboard the Aquarius, Wanczyk felt privileged to provide hands-on care and bear witness to people's stories. "It was an honour to be a point of hope in their traumatic journey," says Wanczyk. "I was so proud of our crew and team for making an effort to make everyone feel safe and to look after them, even in small gestures of kindness." More women and girls than ever before are currently forcibly displaced — at last count an estimated 32 million worldwide. Some are still on the move. Needing access to contraception, or a safe place to deliver their baby, support in the wake of sexual violence or to care for their own children, they are no different to any other woman or girl around the world. But displaced, they have significantly greater health challenges, simply because they are women and girls. 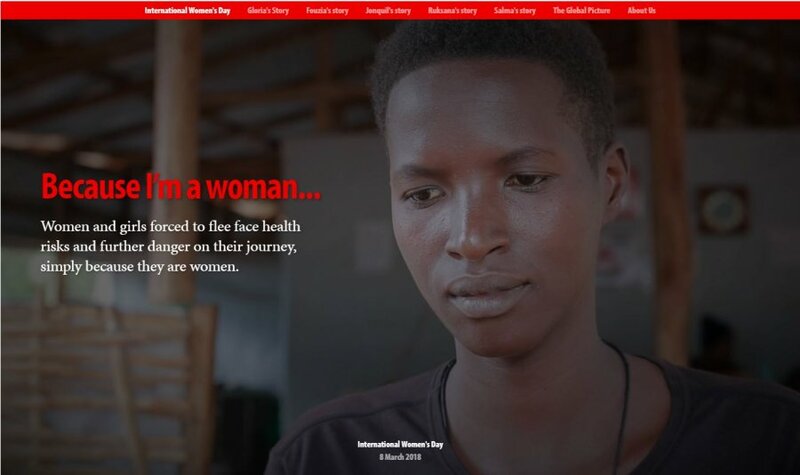 In response, Doctors Without Borders/Médecins Sans Frontières (MSF) has scaled up its action to meet them on their way in places as diverse as Tanzania, Bangladesh and Greece—and many others. Across the spectrum of their journeys, displaced women and girls urgently need care in five key areas: obstetric care, family planning, safe abortion care, sexual violence care and mental healthcare. Only then can they have the chance to navigate their health as they search for safety — and reduce the ongoing risk of sickness, suffering and death. Today marks the release of a new report by Doctors Without Borders/Médecins Sans Frontières (MSF) that shines a light on a humanitarian crisis taking place just south of Canada and the United States, along the migration corridor from Central America northward through Mexico. Forced to Flee Central America's Northern Triangle describes how, instead of asylum, people fleeing violence in El Salvador, Guatemala and Honduras often encounter abuse, extortion and brutality at the hands of criminal networks. Central Americans forced to flee devastating violence in Honduras, Guatemala, and El Salvador are being re-victimized along the migration route to the United States and Mexico, according to a report released today by the medical humanitarian organization Doctors Without Borders/Médecins Sans Frontieres (MSF). "We must not turn our back on our collective responsibility to welcome refugees with dignity, to extend and review individual asylum claims on their merits and, where the latter is lacking, to ensure returnees are only sent back home or to third countries where it is safe to do so. As Canadians, we must open our eyes to the fact that our government already manages our border’s through a complex system of interdiction." 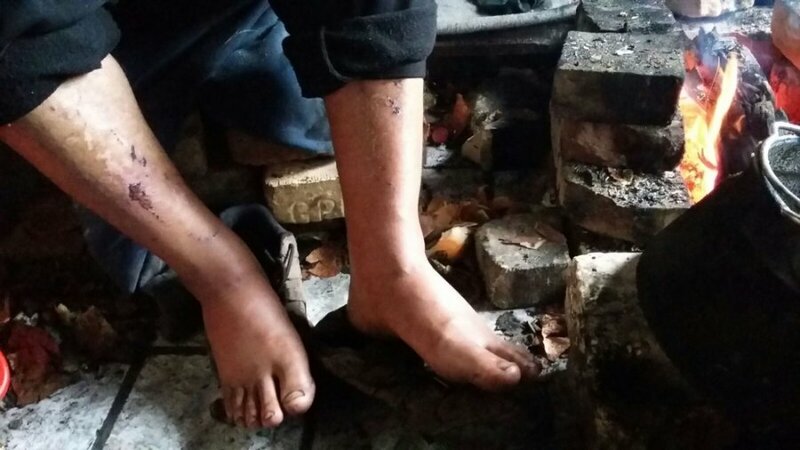 From January 2016 to February 2017, MSF treated 106 cases of injuries allegedly perpetrated by Hungarian border patrols. All cases treated by MSF teams follow similar patterns of violence, including injuries caused by beating (54 cases), dog bites (24 cases), irritations caused by tear gas and pepper spray (15 cases) and other injuries (35 cases). Such abuse did not exclude vulnerable people such as unaccompanied minors: out of 106 cases, 22 were below 18 years old. The dangerous journeys that tens of thousands of Eritreans are making across desert and sea to reach Europe are a striking example of how restrictive migration policies are having a devastating impact on people seeking safety outside their countries of origin, says Doctors Without Borders/Médecins Sans Frontières (MSF) in a new report. Dying to Reach Europe: Eritreans in Search of Safety is based on the first-hand testimonies of refugees who have fled the small but highly militarized east African country, reporting a lack of freedom and forced military conscription for years or even decades. Defectors are at risk of being rounded up, imprisoned, tortured or killed. “Ninety per cent of Eritreans who manage to reach Europe via land and sea are granted asylum. European governments recognize their claims as genuine, but despite this are doing all they can to prevent them and others seeking asylum from reaching EU shores,” said Arjan Hehenkamp, MSF General Director. Many people who are forcibly displaced by war and other catastrophes often flee to refuge within the borders of their own country. 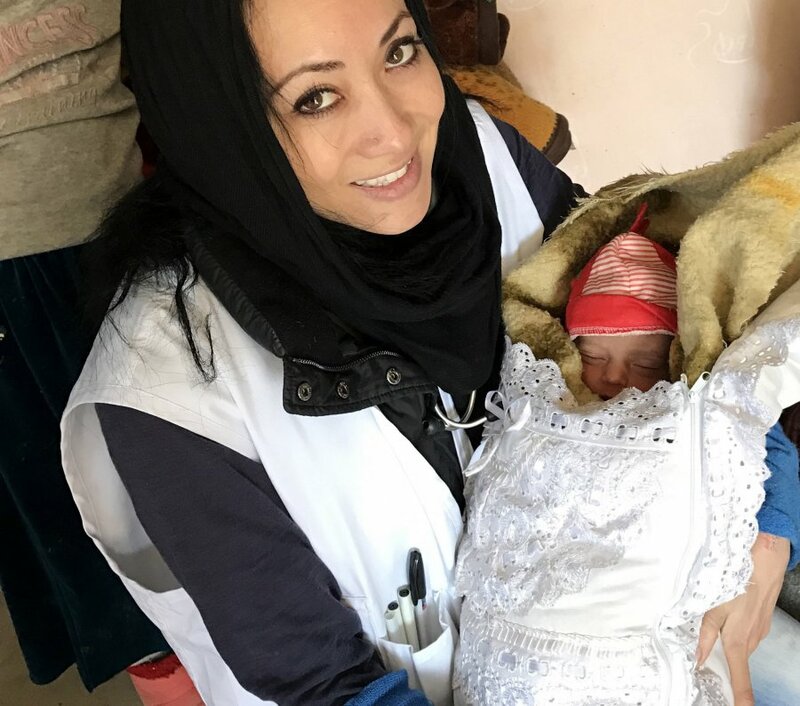 Mariko Miller, an MSF emergency nurse, witnessed the suffering of survivors who managed to escape from the war-torn district of Hawija to the relative safety of Kirkuk in northern Iraq. 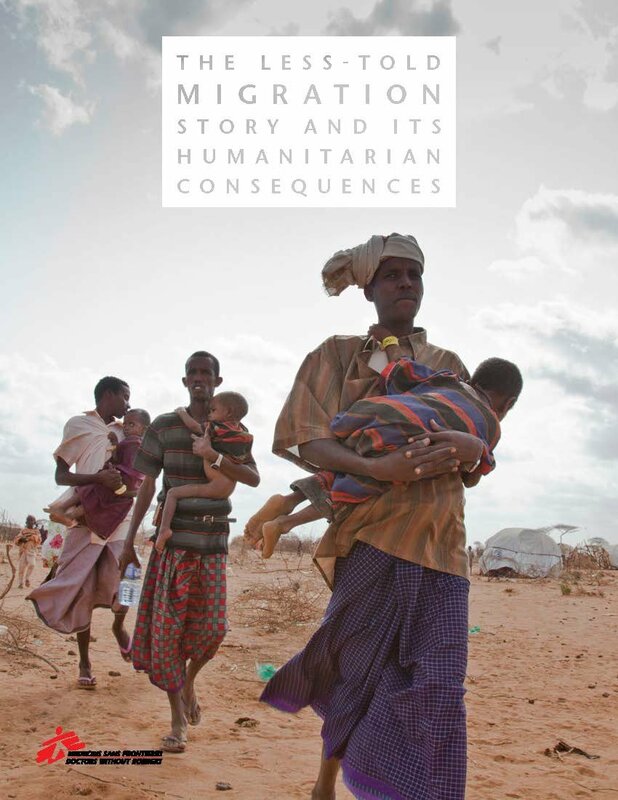 A new report from Doctors Without Borders/Médecins Sans Frontières (MSF) Canada by Sonal Marwah, a Researcher on forced migration and refugee issues, former MSF Canada Executive Director Stephen Cornish and MSF Canada Humanitarian Affairs Advisor Carol Devine looks at the human impact of our current global approach to migrants and refugees. 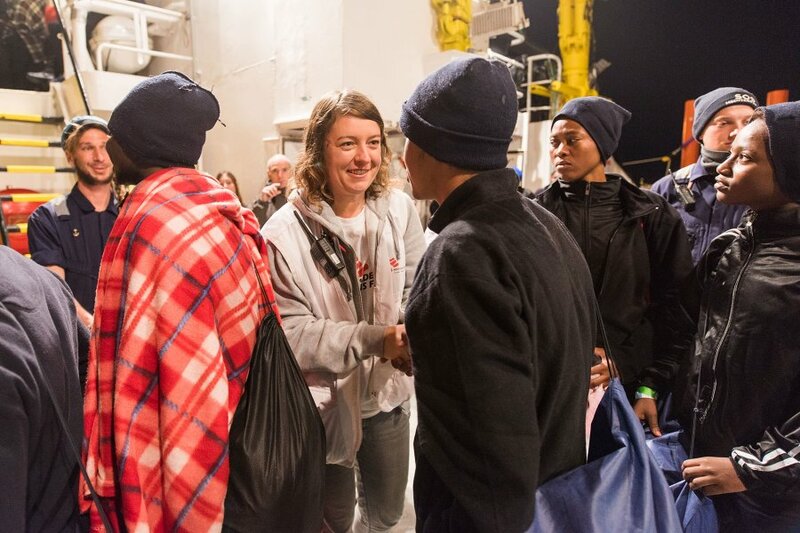 Doctors Without Borders/Médecins Sans Frontières (MSF) midwife Astrid Börjesson describes how she helped deliver a new baby boy last Sunday to a woman who was among the 240 people rescued by the Dignity I, an MSF search-and-rescue ship in the Mediterranean Sea. The 25-year-old woman gave birth to her son, named Divan, after enduring a terrible journey from Cameroon to Libya and on to the Mediterranean Sea in search of hope and safety.